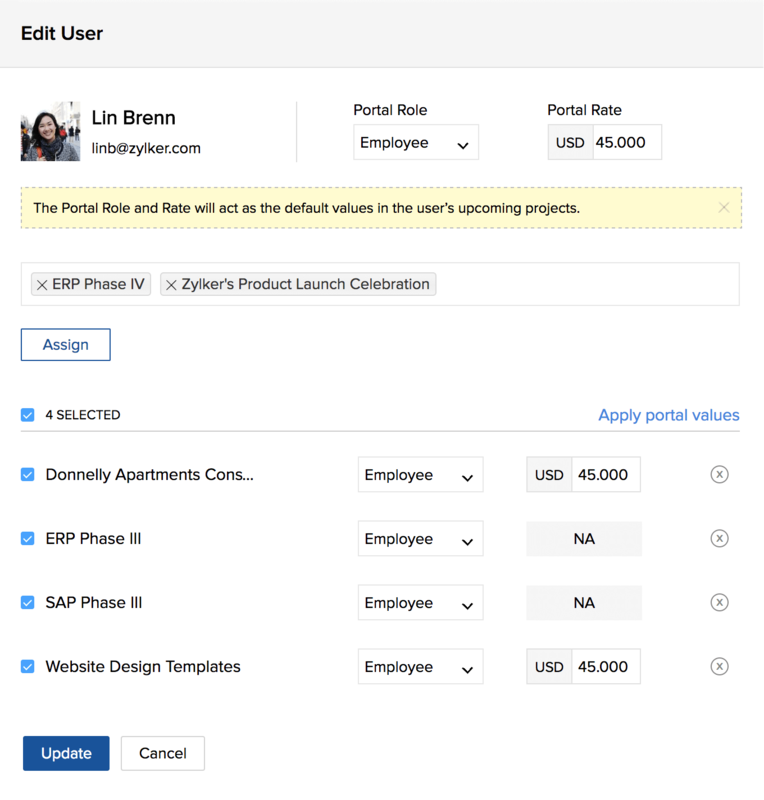 Employees in your organization must be added as portal users before they are assigned to individual projects. Navigate to the Manage Users and then click Portal Users. Click Add User in the upper right corner. Enter a UserEmail address. You can add multiple email addresses separated by a comma. Select a Role and Profile for the users. If your portal is integrated with Zoho Books or Zoho Invoice you can also add user rates. Select the projects from the picklist to add users to them. Existing free plan accounts with more than 5 users Can continue with existing users. New users cannot be added unless you deactivate existing users (If the user count drops below 5, the 5 user limit will apply). Paid plans Standard: 15 users; Express, Premium, and Enterprise: 25 users. Additional users can be purchased as add-ons. Users can be temporarily deactived from the portal. This will not delete the user. The user will not have access to the portal data and can be activated again if necessary. Navigate to the Manage Users section and click Portal Users. Hover over a user and click Deactivate. User will be moved to Deactivated User section. 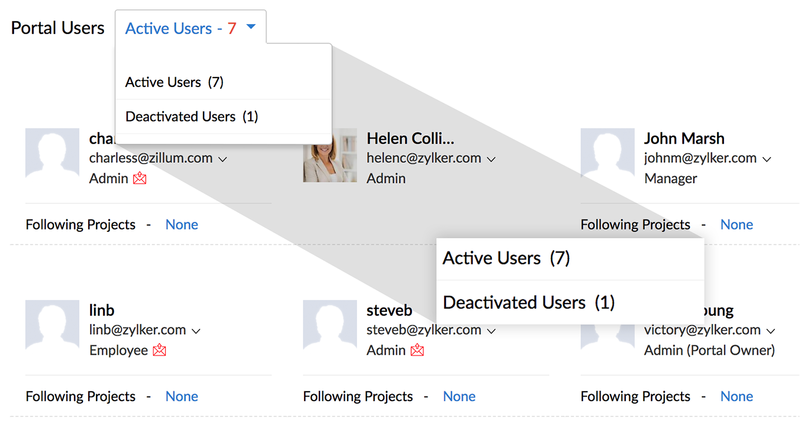 Activate users from the Deactivated Users Section. Hover over the user and click Activate. Click Projects in the top band. Select Users from the left-hand panel. Click Add User in the upper-right corner. Select multiple users to add them in bulk. Select Add New User to add users who are not part of the portal. Enter the email addresses separated by commas. 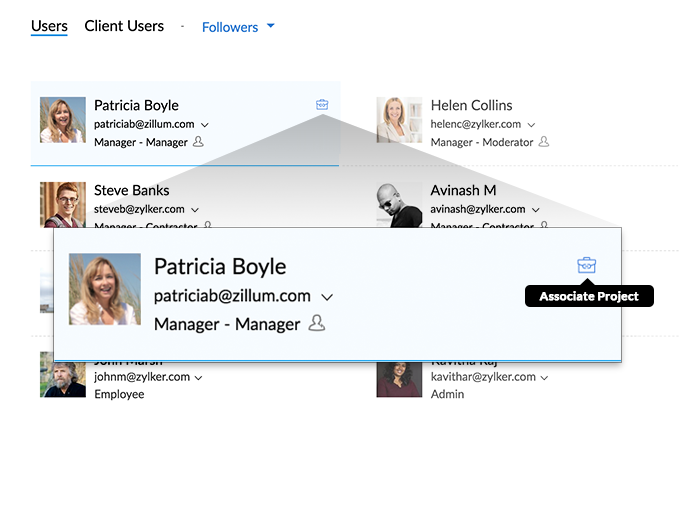 Give each user a Role and assign a Profile. You can add user rates if you have subscribed to Zoho Invoice or Zoho Books and completed the integration. Click Add To List. You can now select the users from the pick list and add them to the project. An email invite is sent to the added users along with the login credentials. Edit user Role, Proile, and User rates from Portal User section. These edits can also be made at an individual project level. You can also apply the user's portal defaults to any project to which they're assigned. Hover over a user to display available actions. Navigate to the Users section and click Portal Users. Check the box if you want to let the user know they've been removed. When you edit a user within a project, the changes you make affect only that project. .
Customize user permissions using the toggle switch. 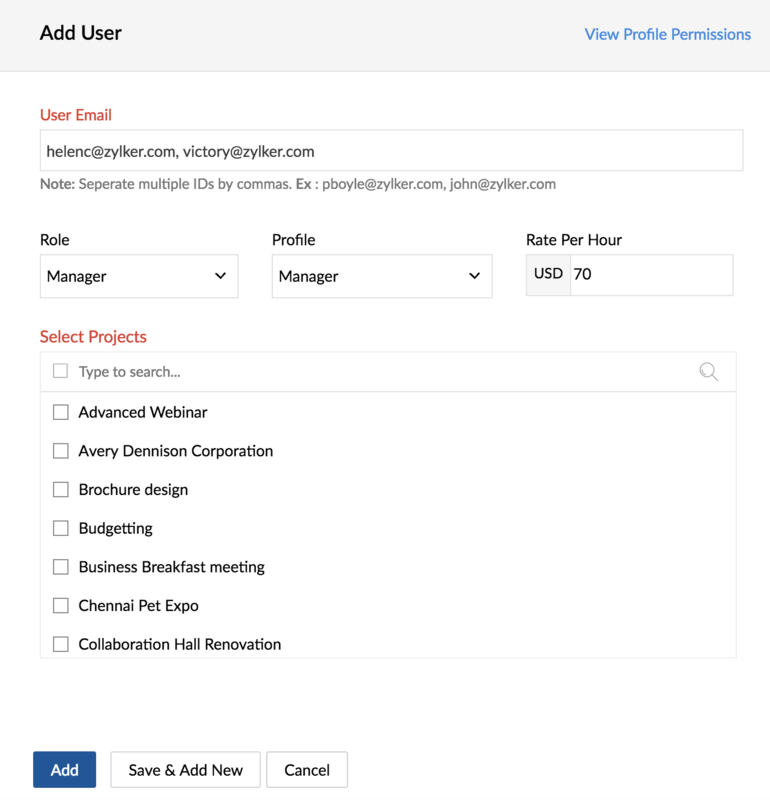 When you edit a user within a project you can also customize their permissions. Hover over a user and then click . Click Customize permissions for this user. Edit permissions as needed and then click Update. 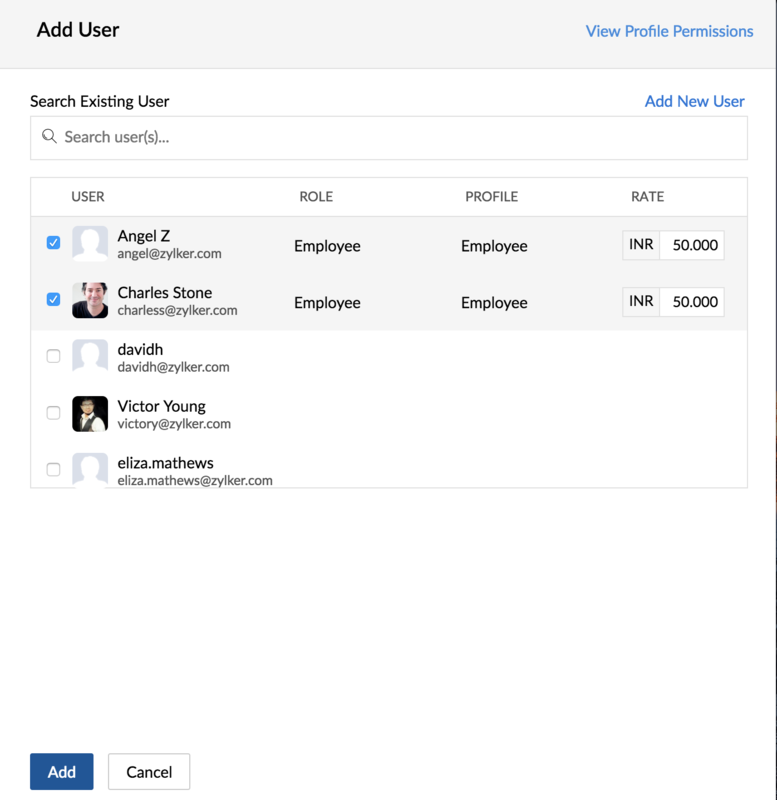 Customized permissions can be cloned from one user and applied to other users. Click and then click Clone Customization. Select project users from the dialog box and then click Copy Permissions. Permission set is copied to the selected users. Customized permissions can be removed and the permissions will revert to portal level client permissions. Click and then click Remove Customization. Permissions will reset to portal level client user permissions. 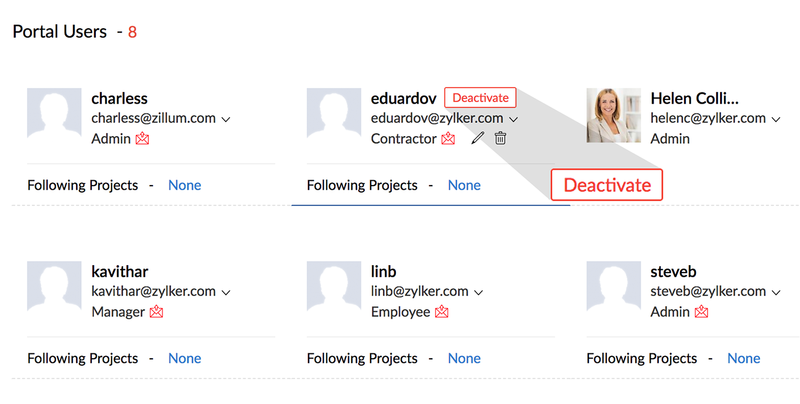 When you delete a user from a project, they'll be removed from that particular project only but not from the entire portal. Select and navigate to Users from the left-hand panel. Sometimes you might want to set one common rate for all the users who hold the same role in your project (for instance, $80/hour for managers and $35/hour for employees), or even set a common rate for all of the users in the project (for instance, $50/hour for everyone regardless of role). The Bulk Rate Update option makes this easier. Click and select Bulk Rate Update. Select a Role to update, using the drop-down menu. Select users by either typing a specific user name into the search field or using the checkboxes to select users from the list. Enter the new rate in the Update Selected Users field. You can follow a project user to know about their project activities. And once you follow a project user, you will be notified about all their project activities in your project Feed. Hover over a project user and click . You can also choose to Unfollow the user if required. You can change viewer or follower into a project user. In the Users tab, click the drop-down arrow next to Users and select Viewers or Followers to display the list of viewers or followers. Hover over the user and click . The Viewer/Follower is now converted into a Project User. Something might have gone wrong at our end. You can either refresh the page and retry or try after sometime. Contact our support team (support@zohobugtracker.com) for more details.